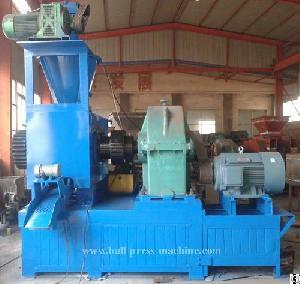 machine, dry powder briquette machine and other briquette machine. It can be used for pressing coal powder, iron powder, coking coal, aluminite powder, scrap iron, oxide-scale, carbon powder, charcoal powder, slag, gypsum, tailings, sludge, Kaolin, activated carbon, dust coke and all kinds of powder, powder materials, waste materials, offscum scrap. Widely used in refractory, power plant, metallurgy, chemical plant, energy resource, transportation, heat supply, etc. The products which after pressed by the iron powder briquette machine are energy saving, environmental protection, convenient transportation, improve the waste using rate, has good economic benefit and social benefit. 5.Less workers, lower payroll costs.